This Truth Squad report covers numerous campaign materials from both sides in the race for the seat in District 63 of the Michigan House of Representatives. House Speaker Jase Bolger faces a challenge from Democrat Bill Farmer. First we look at the anti-Bolger/pro-Farmer materials followed by a review of Bolger’s campaign web site. Questionable statement: "It’s wrong when politicians raise taxes on seniors and the middle class to pay for tax giveaways to big corporations and rich CEOs." Bill Farmer is a Democrat running for the Michigan House against House Speaker Jase Bolger (R-Marshall). The statement on Farmer’s campaign website refers to tax changes pushed by Governor Rick Snyder during his first year in office. Among the changes Snyder was able to move through was elimination of most of the deductions on the income tax, including deductions for pension income and the Earned Income Tax Credit, as well as a freeze on the rate cut at 4.25 percent. He also replaced the Michigan Business Tax with a new 6 percent corporate income tax. The package, explained in large part here, did eliminate the tax credit for pension income for some seniors (the change was phased in based on when the retiree was born), increasing their tax bills. The Senate Fiscal Agency had projected the change would mean $409.1 million for the state fiscal year that just ended, though a small portion of that amount also came from elimination of a credit for unemployment income. In total, the elimination of the various income tax credits was projected to bring $559.1 million the first year and $1.42 billion for the fiscal year that started October 1. So some seniors and those in the middle class will pay more, but so will any "rich CEOs"who saw the same elimination of tax credits. One change could be considered a giveaway to rich CEOs: the package included changes that ensured business owners who paid small business owners who had paid both MBT and personal income tax on their business’ earnings would only pay one tax. The package did, however, constitute a shift from corporate taxes to personal taxes. Initial estimates had the new corporate income tax bringing in nearly $2 billion less than the MBT. The SFA analysis showed the changes would bring in $1.09 billion for last fiscal year and $1.65 billion for the current fiscal year. The plan eliminated most of the credits and deductions that had been allowed under the MBT, but it did allow for programs that would give grants to certain companies and sectors. In short, though, the notion that recent tax changes are "wrong" is fair comment during a political campaign – a claim that voters should recognize as opinion rather than clear fact. Questionable statement: "It’s wrong when politicians protect their lavish perks and expense accounts while cutting money to our local schools." The current year budget restored $200.52 million of that, with $120 more per pupil. So money to local schools has been cut in recent years. But so have "lavish perks and expense accounts" for the Legislature. The current members had their pay cut 10 percent under a recommendation of the State Officers Compensation Commission approved in 2009. The Legislature did increase its funding for the current fiscal year by $6.28 million, but none of that went to operations for either chamber. They held their spending steady from the prior year. Most of the funding, $4.88 million, is for pay increases for employees of the two chambers. Another $1.4 million covered prefunding of retirement health care benefits and $606,200 was moved from the Department of Corrections to cover the Legislative Corrections Ombudsman. Legislators also in 2011 eliminated retirement health care benefits for current and future members through Public Act 200 (Senate Fiscal Agency analysis). Members do have office expense accounts, which include wages and benefits for their office staff, and are reimbursed for certain travel including one round trip to the capital each week. They also receive $900 per month (about $11,000 annually) for food and lodging. But the largely unfettered officeholder expense accounts, funded through contributions, have been gone for more than a decade. Questionable statement: "And when the Speaker of the House himself is under a Grand Jury investigation for illegal activity and rigging an election, it’s time for a real change." A one-member grand jury has been empanelled to investigate whether crimes were committed in the deal struck by Bolger and Rep. Roy Schmidt (R-Grand Rapids) to have Schmidt change parties minutes before the filing deadline for the 2012 election and to have a straw candidate, Matthew Mojzak file on the Democratic ticket in an attempt to prevent that party from running a viable write-in candidate. In the end, the straw candidate withdrew and the Democrats were able to run a candidate who could potentially unseat Schmidt. Schmidt has already been caught lying regarding the situation. He initially said he did not know the person who had filed as a Democrat, but it turned out the man was a family friend and he met him at the Secretary of State Office where he filed his candidacy. There were also allegations that Schmidt had offered to pay the man to run, but there was no proof any money actually changed hands. The Department of State Police investigated whether any election or other laws were broken in the transaction, but the Kent County prosecutor dropped the case before that investigation was completed because he did not see sufficient evidence to file any charges. Questionable statement: "Roy Schmidt signed Affidavit of Identity to run in Republican Primary, agreed not to file until the filing deadline and agreed to find a fraudulent candidate to oppose him." The bolgergate.com website is largely factual, including links to news coverage of the situation and a timeline of the events. It is unquestioned that, on May 3, Schmidt signed his affidavit of identity and around that date reached agreement with Bolger to switch parties. Schmidt did also recruit Mojzak to run as a Democrat in the seat with the understanding that he would not actually lodge a campaign. His spot on the ballot would guarantee him some votes and make it difficult for Democrats to launch a write-in campaign for a candidate who could actually challenge Schmidt. There is evidence that Mojzak lied on his affidavit of identity about how long he had lived in Kent County and that Schmidt had agreed to pay him to run for the seat (no money ever changed hands beyond Schmidt paying the $100 filing fee). Mojzak did change his address to his grandmother’s house to become a resident of the district and has acknowledged that he did not actually move into his grandmother’s house until after the election. So, had that been discovered before the election, he might have been ruled ineligible to run. But his pulling out of the race by the withdrawal deadline made any such complaints moot. Questionable statement: "As their scheme unraveled and the fake candidate backed out of the deal, Bolger and Schmidt then lied to cover up their involvement." The bolgergate website includes an online petition asking Bolger to step down as House speaker because of his involvement in the election scheme. As noted above, Schmidt has been shown to have lied about the effort to have a straw candidate run for his seat as a Democrat, a lie that unraveled during further investigations and was fully exposed with video showing him meeting Mojzak at the Secretary of State branch office. But Bolger has insisted he was not involved in recruiting Mojzak or in the discussions to pay Mojzak to file for the seat. He did, though, acknowledge being evasive initially in answering questions about whether he knew Mojzak had been recruited for the seat. Texts released as part of the investigation showed Bolger was aware that Schmidt had recruited Mojzak to run for the seat ("Plz text me when u have Matthew's paperwork complete," he said in one text), but none show he was involved in the discussions to pay Mojzak to run, or Schmidt’s son to recruit him. Bolger also has supported legislation (House Bill 4907) that would prevent an incumbent from changing parties at the last minute and leaving a party’s ballot spot open. Neither man, however, has denied that they worked together to concoct the scheme that would have Schmidt change parties at the last minute to make it impossible for Democrats to run a candidate against him. In fact, Bolger acknowledged on the filing deadline day that he and Schmidt had been talking for several weeks about Schmidt defecting to the Republican Party. They also discussed Schmidt’s plans for the days after his party change to minimize his interactions with Democrats until reaction to the switch had died down. Overall impression: The claims in these campaign materials are mostly factually substantiated regarding the Bolger-Schmidt affair and the ongoing grand jury investigation. However, Farmer’s campaign webside does not substantiate the claim of "lavish" legislator spending on themselves. Foul or no foul: Foul on Farmer’s campaign website for not backing up claims of "lavish" legislative spending at a time when the legislative record in recent years indicates legislators have reduced their own pay and benefits. Questionable statement: "Representative Bolger's strong leadership in passing a responsible budget, and doing away with the disastrous Michigan Business Tax in favor of a fair and competitive corporate tax, has led Michigan from a worst in the nation jobless rate of over 13% to our current unemployment rate of 9.3%." The unemployment rate has improved since 2010, though it was up to 9.4 percent in August according to the most recent figures from the U.S. Bureau of Labor Statistics. But it is hard to tie the unemployment drops to the tax changes, at least yet. Unemployment rates had been falling for about a year until the beginning of summer. That would put the start of the jobs recovery in the state before the tax changes to which Bolger credits the unemployment improvements. And unemployment in the state has risen every month since May. The changes also have not yet had a full year to affect the economy. Snyder signed PA 38 in May 2011, but the law, for the most part, did not take effect until Jan. 1, 2012. Most residents and many businesses will not see the effects until they file their taxes next year. And a number of businesses, because of tax credits they have, are still paying the MBT. Questionable statement: "Through reforms and fiscal accountability, we've reduced the state's debt by $5.6 billion this past year alone." The state did, as part of the past fiscal year budget, return to prefunding retiree health care benefits. The change reduced the state’s unfunded pension liability by $5.6 billion to about $9.4 billion. So the change did reduce amounts the state would have to pay in the future, but it was not technically money the state had borrowed and spent in the traditional understanding of a debt. Questionable statement: "Bolger started 2011 with 10% pay cut to legislators." The Legislature did see its pay cut by 10 percent per a recommendation from the State Officers Compensation Commission in early 2009, before Bolger became speaker. Both the House (Bolger voted yes) and Senate voted in 2009 to accept the recommendation that also cut pay for the governor, lieutenant governor, secretary of state and attorney general. The commission left the Supreme Court out of the cuts because pay for lower court judges are based on the justices’ salaries. Questionable statement: "Passed the elimination of healthcare benefits for future retired legislators and the majority of current members, including himself." In October 2011, Governor Rick Snyder signed PA 200 (Senate Fiscal Agency analysis) that eliminated retirement health coverage beginning with current legislators. Questionable statement: "Bolger has never received a pension from the taxpayers, only a 401k." Legislators have been under a defined contribution retirement plan since 1997 when state employees were changed to a 401(k)-style plan. The change then put new employees, and new legislators, under defined benefit. With term limits, all legislators elected since 2000 have been under that system. Questionable statement: "Cut his office budget as Speaker by 23%." Bolger cut his office budget by 10 percent when he first took office in January 2011, but cut his budget further for the 2011-12 budget, officials in his office said. The cuts were also extended to other leadership offices. The cuts reached 23 percent. Questionable statement: "Changed healthcare contributions for House employees, capping the amount paid by taxpayers." Bolger also, through the House Business Office, increased the employee share of their health insurance to 20 percent as part of discussions of requiring the same proportions from other state and local employees. The changes took effect in fall 2011 as part of the open enrollment for health plans. The House also added a health savings account and some other options as part of the change. Questionable statement: "Passed Bridge Card (welfare) reform by banning the use of bridge cards by felons, at casino ATMs or for tobacco, alcohol and lottery ticket purchases." The Legislature passed a number of bills over the past year that limited use of bridge cards, which is how cash welfare benefits are distributed. PA 197 of 2012 (House Fiscal Agency analysis) prohibits their use in casino ATMs and PA 281 of 2012 (Senate Fiscal Agency analysis) prohibits issuing bridge cards to inmates. The House passed a bill (HB 4722) that would have, in addition to prohibiting bridge card use at casinos, prevented their use for alcohol, tobacco and lottery tickets, but the Senate version of the legislation, with those provisions removed, was finally enacted. Questionable statement: "Opposed the spending of state money to set up health exchanges, as required by Obamacare." The Senate passed legislation in November 2011 to create a health exchange under the federal Patient Protection and Affordable Care Act where individuals can compare rates and coverage for health insurance online (SB 693). And Gov. Rick Snyder had recommended appropriating funds to run the new exchange. The House has been the block to creating a health exchange in the state, with Bolger and other leaders first pushing to wait until the U.S. Supreme Court ruled on the constitutionality of the federal health care reforms. After the court upheld the law, House Republicans have opted to allow the federal government to set up an exchange rather than have the state run it. There appears to be some agreement with Attorney General Bill Schuette that Mitt Romney will win the presidency and repeal the law, making efforts to enact the exchange moot. Snyder has instead been working with federal officials to create a hybrid exchange, run by the federal government but with some state control. Questionable statement: "Eliminated more than 200 unnecessary and obsolete regulations." Gov. Snyder has spent the last year working through administrative rules in the various departments finding those that are obsolete, conflict state or federal law or other rules, or that are more stringent than federal requirements and modifying or rescinding those rules. While much of the work has been done through the administrative rules process, some has been done through the Legislature to repeal authority for rules that are no longer needed. Depending on how you define a regulation, 200 is probably not an exaggeration. The Office of Regulatory Reinvention, which oversees the rules process for the Snyder administration, count 853 net rules eliminated since it began the review in April 2011. Questionable statement: "Protected seniors over age 67 from paying a pension tax." When Snyder first proposed his income tax changes, he provided a blanket repeal of the pension credit for retirees. But the House created a tiered system that keeps an exemption for those currently over age 67, who would not pay taxes on pensions less than $45,120 per individual from private employment and would pay no taxes on any public pension earnings. Under the plan provided in PA 38 of 2011, those between ages 60 and 67 this year would have lesser exemptions until they reach age 67, and those under age 60 would have no exemptions. The Legislature has been working on a bill (SB 409) that would expand the exemptions for police and firefighters, as retirees from those professions do not collect Social Security. Overall impression: Bolger's website is aimed at touting his record, as opposed to going after his not-well-known opponent. But his materials engage in some truth-stretching for his headline-style claims which overstate his role in various changes in Lansing. For example, by reading his website a voter could easily come to the conclusion that Bolger single-handedly imposed legislative pay cuts and eliminated many burdensome regulations. 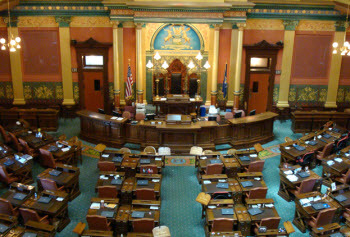 In fact, those changes required the actions of many in the legislative and executive branches of Michigan state government. Foul or no foul: Technical foul for implying Bolger had a greater-than-actual role on cutting legislator pay and regulations.